The blue skies? Life within a family and growing up with them while growing yourself is unimaginably rich. The silver lining to not being able to find stuff where you last left it? with a rich family life, it doesn’t seem to matter so much anymore. it’s enough to know you can make do with what you have, or create or invent something else that works just as well, maybe better! and still. there is that need to have files where you can access them, and it’s important to let go of “things” that you no longer need. as Americans we have stuff inside of stuff. Garages and storage units full of stuff that we don’t use. Maybe someone else can … hmmm. A great book that i read a number of years ago surfaced during our recent move, and I’m re-reading it. 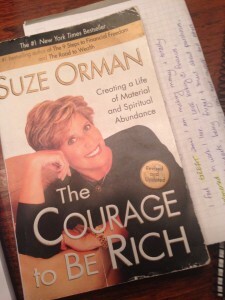 The Courage to be Rich by Suze Orman. yep, I can hear some of you moaning a bit, Suze being right up there with perhaps Dr. Phil and Oprah. this tome is different. i promise! the way i describe it to friends who might be interested is that it is more about the psychology of money than about how to earn or invest that money. honestly? it helped me break through some blocks I have carried for a long time about what success means. about what money means. about what i absorbed about money while growing up. 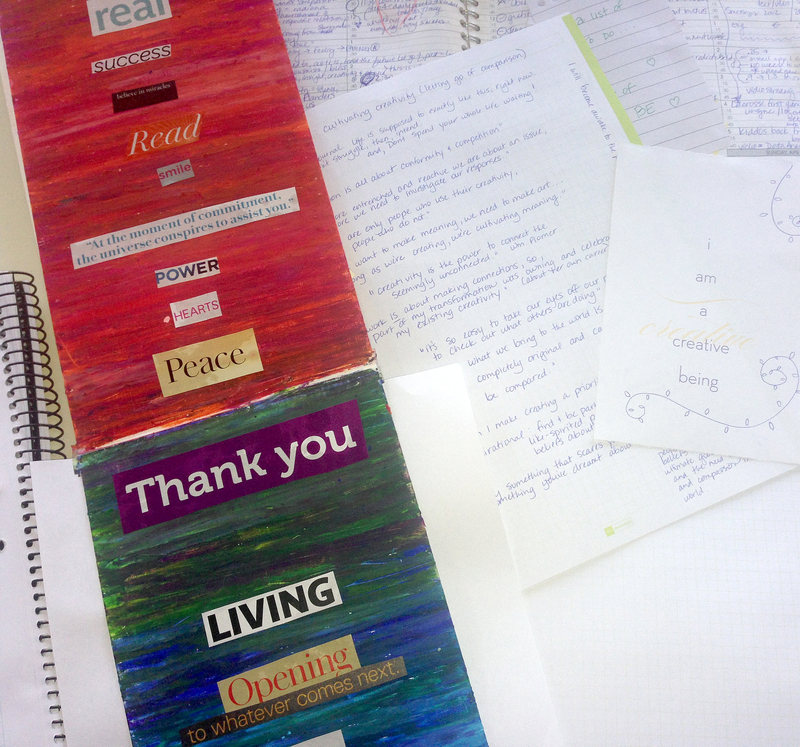 what helps me and what i can now let go. The first chapter (The Courage to Look Within) has some exercises i highly recommend following through to completion. If you’re feeling stuck around money, don’t just go through the motions, give it some time to roll around within you and then do the writing. see what comes up. i was completely surprised at how much insight came home for me. 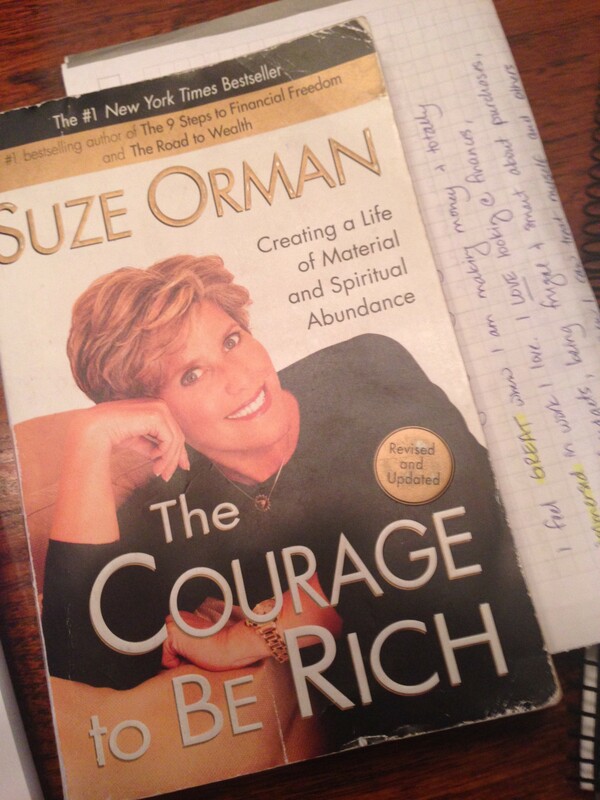 “The Courage to Have More and to Be More” chapter was also powerful for me. Suze talks quite a bit about how powerful words are, and segues into showing how the words and phrases that we use around money can help us become rich, or keep us in poverty. the book’s subtitle is Creating a Life of Material and Spiritual Abundance, so when she uses the word poverty she is referencing not only lack of material wealth, but also a poverty of the spirit. “People, then Money, then Things,” is a prioritization i can embrace. chapters three and four go through the mental and physical process of really looking at your clutter, from files to boxes of ‘stuff,’ to drawers, closets and cupboards that have accumulated items you no longer need or want. And then methods to get rid of them so as to make room in your life for what you care about. you can start to think of items in your life as luxuries or necessities, know their true cost, and decide if that is money you want to save so as to use it down the road for higher purposes. and this is where I am. We moved just before the school year ended, and then had a whirlwind of a summer with both kiddos doing some major transitions. Through this, we’ve carved out workable space in the garage, AND I know what is in every box left in the garage. see? I DO know where something is at! the next steps are moving into the office with the filing cabinets and paying some mind to some neglected files. I’ll let you know how it’s going. i double-dog dare ya! if you’ve read this, or might want to, let me know — I’d love to have a book buddy to bounce ideas with!